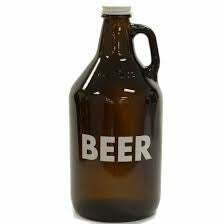 A quick update from your intrepid Beer Feels blogger: while continuing for another year to investigate the important question of which feels better: a bottle or can, I came across a novel and wonderful beverage container called — and I apologize if I’m mispronouncing this — a growler. I thought it of utmost importance to provide a review of how this beer feels, so I took a break from my research to bring this information to you, my readers. If I could describe how this beer feels in one word, I would say: heavy. Very similar to a bottle, but definitely heavier. Might have something to do with the size, but I’m no physicist. Upon further research, I found that some fine establishments even sell PBR in this vessel! This might be just the gift for all your beer-loving friends out there. Welp, back to my research. A very merry Christmas to all!